Mission "To increase and diffuse geographic knowledge while promoting the conservation of the world's cultural, historical, and natural resources." Founded in January 1888, it has funded more than 7,500 scientific research projects and supports an education program combating geographic illiteracy. It is estimated that it reaches more than 280 million people worldwide each month through its many media outlets. Its extremely successful National Geographic Magazine has, through its use of photojournalism and quality writing, served to bridge cultures and enlighten people to the beauty of the Earth and the plight of its environmental condition. Formed with the mission to "increase and diffuse geographic knowledge while promoting the conservation of the world's cultural, historical, and natural resources," it is a noble mission which has succeeded in many ways. The historical mission of the National Geographic Society is "to increase and diffuse geographic knowledge while promoting the conservation of the world's cultural, historical, and natural resources." As NGS President and CEO (since March 1998), John Fahey succinctly put it; its purpose is to inspire people to care about the planet. The Society is governed by a twenty-three member Board of Trustees composed of educators, businesspeople, scientists, former governmental officials, and conservationists. The organization sponsors and funds scientific research and exploration. The publication of an official journal, National Geographic Magazine, and other magazines, books, school products, maps, other publications, web and film products in numerous languages and countries around the world. An educational foundation which provides grants to education organizations and individuals to enhance geography education. Its Committee for Research and Exploration has given grants for scientific research for most of the Society's history and has recently awarded its 9,000th grant for scientific research, conducted worldwide and often reported on by its media properties. Various media outlets which reach approximately 360 million people around the world each month. A museum, free to the public, in downtown Washington, D.C., which sponsors a wide variety of changing exhibitions as well as permanent and interactive displays from around the world. 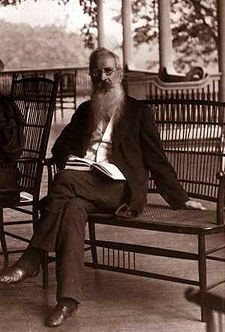 Gardiner Greene Hubbard, first president of the National Geographic Society. On January 13, 1888, thirty-three explorers and scientists gathered at the Cosmos Club, a private club then located on Lafayette Square in Washington, D.C., to organize "a society for the increase and diffusion of geographical knowledge." After preparing a constitution and a plan of organization, the National Geographic Society was incorporated two weeks later on January 27. Gardiner Greene Hubbard became its first president and his son-in-law, Alexander Graham Bell, eventually succeeded him in 1897 following his death. Bell's son-in-law Gilbert Hovey Grosvenor was named the first full-time editor of National Geographic Magazine and served the organization for fifty-five years; members of the Grosvenor family have played important roles in the organization since. Bell and his son-in-law, Grosvenor, devised the successful marketing notion of Society membership and the first major use of photographs to tell stories in magazines. The Chairman of the Board of Trustees of National Geographic in 2008 is Gilbert Melville Grosvenor, who received the Presidential Medal of Freedom in 2005 for the Society's leadership in geography education. In 2004, the National Geographic Headquarters in Washington, D.C. was one of the first buildings to receive a "Green" certification from Global Green USA in recognition of their efforts "to support a sustainable and secure world." The Society received the prestigious Prince of Asturias Award for Communications and Humanity in October 2006 in Oviedo, Spain. Cover of January, 1915, National Geographic magazine with traditional yellow border. The National Geographic Magazine, later shortened to National Geographic, is the official journal of the National Geographic Society. Its first issue was published nine months after the Society was founded. It has become one of the world's best-known magazines and is immediately identifiable by the characteristic yellow border running around the edge of its cover. There are 12 monthly issues of National Geographic per year, plus additional map supplements. On rare occasions, special editions are also issued. The magazine is published in 31 language editions in many countries around the world. Combined English and other language circulation is nearly nine million monthly with more than fifty million readers per month. It contains articles about geography, popular science, world history, culture, current events, and photography. The fame of the magazine worldwide resulted from its pioneering use of photojournalism, providing spectacular color images of nature from locations around the world. Beyond introducing the public to the beauties of nature, the magazine has more recently taken on a number of issues related to preservation and stewardship of the environment, thus contributing to human responsibility for the beauties of creation. National Geographic Kids: launched in 1975 as National Geographic World, it adopted its current name in 2001. It has a U.S. circulation of over 1 1/2 million. There are also currently 18 local language editions of NG Kids, with another half million in circulation. An Arabic edition of the children's magazine was launched in Egypt in early 2007, and more than 42,000 copies are distributed to all the public schools in Egypt, in addition to another 15,000 single copy sales. More recently, an Albanian edition was launched. National Geographic Little Kids: for children aged three to six. National Geographic Traveler: launched in 1984. There are seven language editions of NG Traveler. National Geographic Explorer: classroom magazine launched in 2001 as National Geographic for Kids, which has grown to about 2 1/2 million circulation. The National Geographic School Bulletin, a magazine similar to the National Geographic but aimed at grade school children, was published weekly during the school year from 1919 to 1975, when it was replaced by National Geographic World. During the 1980s and 1990s, it published a research journal which later closed. In October 2007, National Geographic created a new Global Media group composed of its magazine, book publishing, television, film, music, radio, digital media and maps units. Tim Kelly, president and CEO of National Geographic Ventures, was named president. Stories by the National Geographic Society are shown on television. National Geographic specials as well as television series have been shown on PBS and other networks in the United States and globally for many years. The Geographic series in the U.S. started on CBS in 1964, moved to ABC in 1973 and shifted to PBS (produced by WQED, Pittsburgh) in 1975. It has featured stories on numerous scientific figures such as Louis Leakey, Jacques Cousteau, and Jane Goodall that not only featured their work but helped make them world-famous and accessible to millions. The specials' theme music, by Elmer Bernstein, was also adopted by the National Geographic Channel. The National Geographic Channel has begun to launch a number of subbranded channels in international markets, such as Nat Geo Wild, Nat Geo Adventure, Nat Geo Junior, and Nat Geo Music. In 1997, internationally, and in 2001 in the United States, the Society launched, in part ownership with other entities such as News Corporation, the National Geographic Channel, a television channel with global distribution for cable and satellite viewers. National Geographic Films, a wholly-owned taxable subsidiary of the National Geographic Society, produced a feature film based on the diary of a Russian submarine commander starring Harrison Ford in K-19: The Widowmaker, and March of the Penguins, which received an Academy Award for the Best Documentary in 2006. Arctic Tale, features the story of two families of walrus and polar bears. Inspired by a National Geographic Magazine article, National Geographic opened in October 2007 a 3-D large format and Reality 3-D film called Sea Monsters, with a musical score by Peter Gabriel. National Geographic Films is co-producing with Edward Norton and Brad Pitt the 10-hour mini series of Steven Ambrose's award-winning Undaunted Courage: Meriwether Lewis, Thomas Jefferson and the Opening of the American West for HBO. The National Geographic website (nationalgeographic.com) provides a wealth of content in multimedia formats, including a recently launched site highlighting world music. The Society sponsors the National Geographic Bee, an annual geographic contest for American middle-school students. More than four million students a year begin the geography competition locally, which culminates in a national competition of the winners of each state each May in Washington, D.C. Every two years, the Society conducts an international geography competition of competing teams from all over the world. The 2007 contest was held at Marineworld in San Diego, California with representatives from 18 international teams. The team from Mexico emerged as the winner. Anne Morrow Lindbergh's customized "Hubbard Metal" medal detailing her famous and unprecedented flight route. The Hubbard Medal is awarded by the National Geographic Society for distinction in exploration, discovery, and research. The Society's most prestigious honor, the medal is named for Gardiner Greene Hubbard, the first National Geographic Society president. Past recipients of the award include; Polar explorers Roald Amundsen in 1907, Sir Ernest Shackleton in 1910 and Richard Byrd in 1926; aviators Charles Lindbergh in 1927 and Anne Morrow Lindbergh in 1934; anthropologists Louis and Mary Leakey in 1962; Apollo 11 astronauts Neil Armstrong, Edwin Aldrin and Michael Collins in 1970; anthropologist Richard Leakey in 1994; conservationist Jane Goodall in 1995; underwater explorer Robert Ballard in 1996; and balloonists Bertrand Piccard and Brian Jones in 1999, and posthumously in 2000 to Matthew Henson, who with Robert Peary led the 1909 American expedition to the North Pole. ↑ National Geographic Society National Geographic Online Retrieved May 25, 2008. ↑ National Geographic Society National Geographic Education Foundation Retrieved May 25, 2008. ↑ U.S. Department of State National Geographic Society Retrieved May 25, 2008. ↑ National Geographic Society National Geographic Museum at Explorers Hall Retrieved May 25, 2008. ↑ Global Green USA Global Green USA's Green Cross Millennium Awards Retrieved May 25, 2008. ↑ National Geographic Society National Geographic News Retrieved May 25, 2008. ↑ National Geographic Society Hubbard Medal to be awarded to late explorer Matthew Henson Retrieved May 25, 2008. NGS Collectors Corner - managed by National Geographic Libraries' Archives. 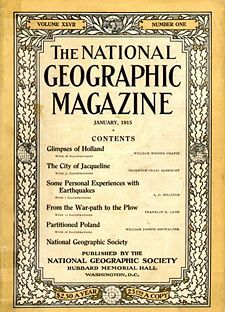 History of "National Geographic Society"
This page was last modified on 9 November 2018, at 18:05.